Picture this: you’re optioning out your new car and you get down to the tires and wheels part of the build. You have the option of 17-inch, 18-inch or 19-inch wheels. Which do you choose? This is an important decision, because not only does wheel size affect a car’s performance, it also influences its comfort and noise level. In 2010, Car and Driver tested a variety of tire sizes and published a handy chart explaining the differences. Tyre Reviews new video, however, allows you to see how the different sized tires perform in the real world. 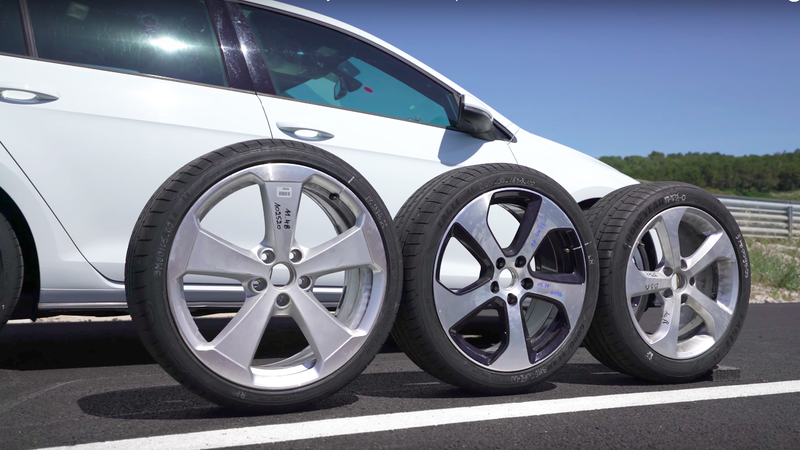 In it, we see 17-inch, 18-inch and 19-inch wheels tested out on a Volkswagen Golf GTI, each with the same tire. Between dry handling, wet handling and noise tests, subjective and objective aspects were considered. Tester Jonathan Benson said that he’d prefer the 18-inch wheels on the Golf GTI. Check out the vid to see why.